Transition by CodeFN42 is a Virtual Instrument Audio Plugin. It functions as a VST Plugin. Wow, that's really impressive! Easy to use, so much fun. You can easily dive in without reading manual or figuring out all these incredible functions. Instrument for uncontrollable melodic mess. It took me just several minutes to fall in love with this little tool. And it's for free, i can't believe that. Endless possibilities and fun. With "random" and "probability" it is easy to go from generic pattern to complete chaos, in any preferable key. 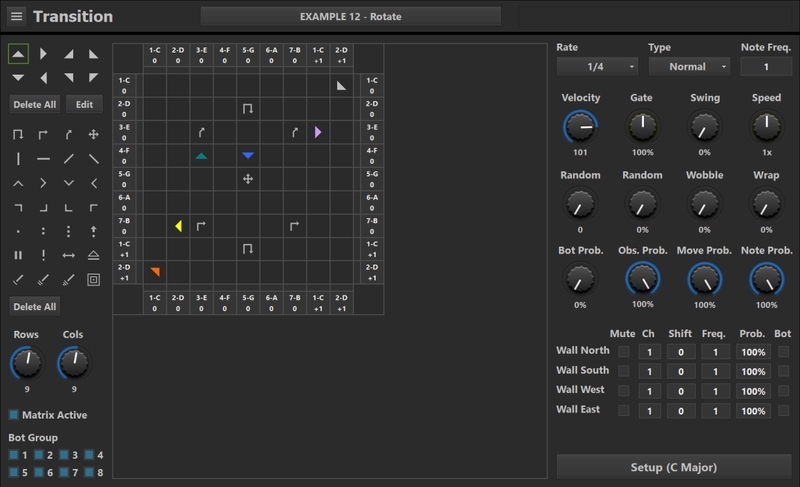 It's like you're not writing music anymore with this "bots and obstacles" window, just playing fun game. I love it. can't complain for a freebie though..
Actually, same here with Live, but in Reaper everything is ok.
Just curious- was this inspired by ToneCarver's Nova3 (which was itself inspired by Otomata)? I've been enjoying Nova3 for a while now, and it was the first thing I thought of when I saw the pic of Transition. Super fun! Works good in Tracktion Waveform 9. One glitch, with a synth - VacuumPro cutting out after a lot of play, resolved by deleting the plug and re-inserting it, leading me back to more fun. Update: Inserting 2 or more instances into Waveform brings about crashes fairly quickly. Sure is fun before it bails! Hope this can be stabilized going forward. Are you using version 1.02? Just tested with 5 instances of Transition and 5 synths in Reaper, letting it run for 90 minutes, while recording the output. No crashes. Thanks for the heads up regarding v 1.02. I just downloaded and installed it yesterday, which was reporting as v 1.00 in the Waveform plugin browser under the Description Tag column. I Re-downloaded and installed today and Waveform still reports it as v 1.00, yet the plugs About shows it as v 1.02. It's still crashing when I use more than one instance. : (. Update: Coming back into the edit after a crash, I started over with one instance, made a VacuumPro synth patch change as the edit was playing, then added another track / instance and it stayed functional. Repeated this pattern and have 5 tracks running great for over 10 minutes. Makes me wonder about VacuumPro interaction, in that as I first reported it cut out after a bit and needed to be reloaded. This is a ridiculously fun plug, thank you! !.